State senator: "He was shooting at just ordinary people going about their business"
(CNN) -- At least 10 people were killed Tuesday in a shooting spree that spanned two small southern Alabama towns, state officials confirmed. The gunman, who turned the gun on himself, and the wife and child of a sheriff's deputy were among those killed. 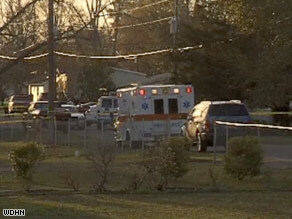 An ambulance rushes to the scene of a multiple shooting in Samson, Alabama, on Tuesday afternoon. The shooting started in a neighborhood in Samson, a town of about 3,000 about 15 miles north of the Florida border, just after 4 p.m. (5 p.m. ET) and ended 12 miles away at a manufacturing plant in Geneva, said Alabama state Sen. Harri Anne Smith, who represents Geneva County. "He was shooting at just ordinary people going about their business," Smith told CNN, saying she had been briefed by state and local law enforcement. The gunman, whose identity was not disclosed, shot himself at the Reliable Metal Products plant, state public safety spokesman Kevin Cook told CNN. Authorities are also investigating an arson at a residence in neighboring Coffee County, where a body was found. That incident is thought to be related to the shootings, Cook said. Investigators are trying to determine whether the gunman, who Cook said was armed with a semi-automatic weapon, knew any of the victims. State police Cpl. Steve Jarrett told reporters that the gunman killed six adults and one child in three residences in Samson, before heading down state Highway 52, firing at least seven bullets into a state trooper car. The trooper sustained minor injuries from shattered glass. "I can't describe what happened, why it happened," Ward told CNN affiliate WTVY. "It's just a sad day for Geneva County." A witness told CNN Radio she saw a woman's body at the Big-Little Store service station off the highway as people gathered at the crime scene. "Then the subject entered the business. Within minutes, shots were heard. ... Law enforcement officers found him dead," Jarrett said. Sheriff's officials says the gunman was a former employee of Reliable Metal, CNN affiliate WEAR-TV reported. The FBI bureau in Mobile, Alabama, sent an agent to assist the Geneva County sheriff's office and local police, a spokeswoman for the FBI said. Col. Christopher Murphy, head of the Alabama Department of Public Safety, called the southern Alabama shooting spree "the worst that DPS has a memory of." Another mass killing occurred in southern Alabama in 2002, when Westley Devon Harris gunned down six members of his 16-year-old girlfriend's family at their farm in Luverne. Harris was convicted and sentenced to the death penalty in 2005.